„In a business jet across Europe"
Last May 2013, on the occasion of my visit at the European Business Convention & Exhibition (EBACE) in Geneva, I have noticed the little Eclipse 500T in the static displays. Hardly bigger than a common light aircraft it would fit in one of my glass cabinets at home, in addition to all the other models of aircraft I collect! After a detailed discussion, information and explanations on the spot about the benefits of the Eclipse 500T, David Hayman, CEO of Aeris Aviation Ltd. UK, invited me spontaneously to join a demo flight with the Eclipse 500T. Aeris Aviation Ltd. is the exclusive distributor of the Eclipse 500T/550 for Europe. An offer that only a few weeks late came true, in a fantastic flying experience across Europe! Ups and downs for a small U.S aircraft manufactory! Thus, or similar could describe the turbulent first years of the former American aircraft manufacturer Eclipse Aviation. Established in 1998 by former Microsoft executive Vern Raburn, it was headquartered with the production halls in Albuquerque, New Mexico. The company set the goal of building a low-cost small-jet with low fuel consumption and low operating costs, a so-called "very light jet". This results in developing the Eclipse 400, a single-engine small-Jet with V-tail, and in a further step, the Eclipse 500 with two rear-mounted turbofan engines by Pratt & Whitney Canada PW610F. Customer interest on the Eclipse 500, mainly in the U.S. market was remarkable and so placed, among others, the following companies their first orders; Day Jet (28), University Air Center (2), Linear Air (4), North American Jet Charter (7) Rocky Mountain Sport Jets (5). Up to the first scheduled deliveries in 2006, the company reported already about 200 orders for the Eclipse 500 including those payments. In 2007, the workforce was about 1,300 people and the future "seemed" safe. A fallacy as it turned out later! The management had production costs massively underestimated which resulted in considerable financial problems. That was not enough, in the summer of 2007 the company needed to significantly increase the selling price of the Eclipse 500; much to the annoyance of the existing customers and new prospective customers. The financial situation, but also difficulties in the types-certification led the company in 2008 into bankruptcy protection under Chapter 11 on 25th November the same year. Because of the hopeless situation of a restructuring, insolvency proceedings under Chapter 7 (liquidation) was continued and scheduled in an auction of all the equipment in August 2009. In the meantime, the former distribution partner ETIRC tried to take over and rescue Eclipse Aviation to continue the production and maintenance of the Eclipse 500. However, ETIRC also was not able to afford the financial means and had to declare by the end of 2009 bankruptcy as well. Thus was the end of the former Eclipse Aviation. In the subsequent bankruptcy proceedings, Mason Holland and Mike Press from South Carolina received on 20th August 2009 the contract to take over the shares, worth around $ 40 million. She then founded the new Eclipse Aerospace and took over the production and maintenance facilities in Albuquerque, New Mexico as well as the whole distribution. 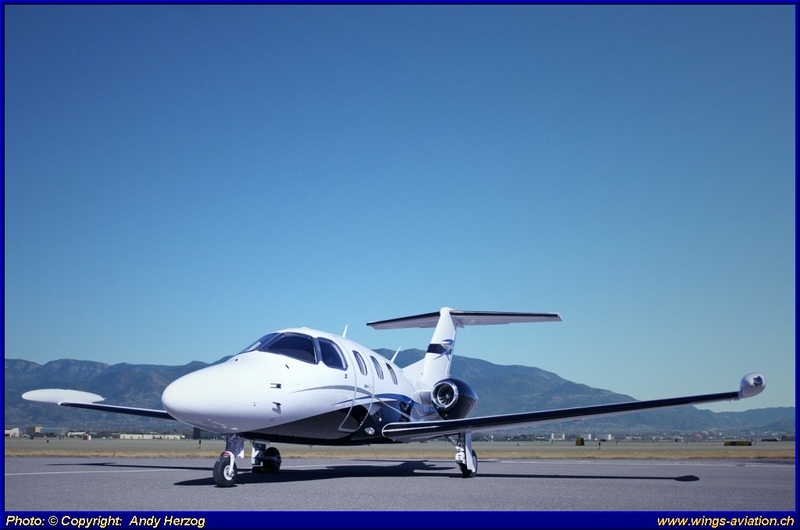 With United Technology Corporation as new partner, who participated in 2011 with shares in Eclipse Aerospace, a new beginning of production of the Eclipse 500, went on its way. In the meantime the improved Eclipse 500T was supplemented by the 550 variant in late 2013. Basically, the new 550 version is based on the Eclipse 500T and is externally almost indistinguishable from each other. The all-renewal primarily affects the cockpit that was equipped with the latest avionics and an advanced flight management system. In March 2013, the first Eclipse 550 was able to start the test program. Over the summer, the 550 has gradually acquired all governmental approvals. From September 13, the production will begin and first deliveries to customers are due by October / November 2013. An important milestone for the company was undoubtedly the signing of the cooperation with PZL Mielec in Poland, a subsidiary of Sikorsky Group. PZL will be responsible for the construction of the fuselage, and the wings, which are then shipped for final assembly to Albuquerque. The price for the standard version of the Eclipse 550 is approximately US $ 2.89 million and planned are a production rate, depending on demand, of 50-100 aircrafts per year. On October 22nd 13, at the NBAA in Las Vegas, Nevada, the new Eclipse 550 was unveiled in a ceremony to the general public. Will be the Eclipse 550 the next “Tour-Jet” by Iron Maiden? Probably not; simply because it is too small to carry the whole entourage of the heavy metal band, Iron Maiden. 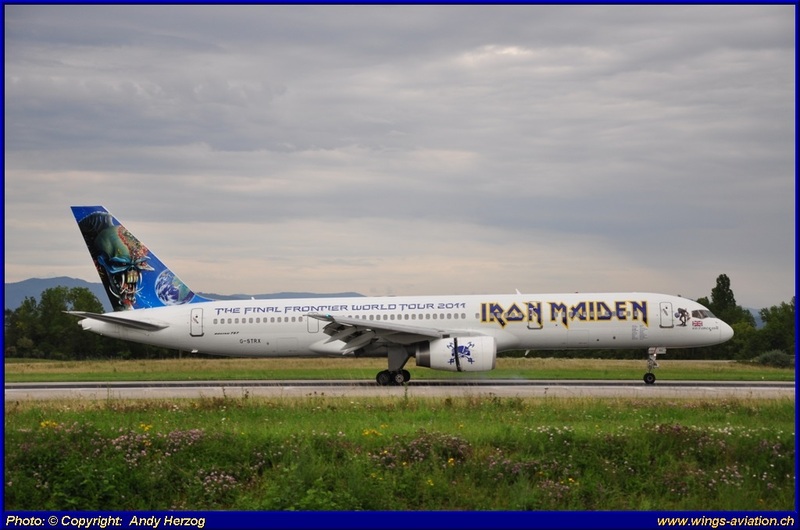 "However, it is a fantastic business jet with best economic and ecological properties"; so the statement of Iron Maiden lead singer and pilot, Bruce Dickinson. He should know it; Dickinson was able to complete his training and type rating on an Eclipse 500T last September. During his venues tour in 2013 in the U.S., he flew the aircraft himself to the various concerts and brought it to more than 50 hours of flight time on this type. This is not a novelty for Bruce Dickinson, however he flew during the last concert tour "The Final Frontier World Tour 2011" the Astraeus Boeing B757-28A, G-STRX "ED FORCE ONE" each time from gig to gig. Most Spotter colleagues may surely still remember the ingenious painted Boeing 757! In addition to his career as a singer and Pilot, Dickinson is also a businessman. Clearly convinced of the performance of this business jets, it was only a small step to share with Aeris Aviation-UK together the European market to sell the Eclipse. Initial discussions with Dickinson's company Cardiff Aviation in St. Athan, Wales and Aeris Aviation (UK) are on the way and let a lot of potential imagine. The testimony of these two men, I can only confirm at this point, did I have the opportunity to fly with them in the Eclipse 500T. Truly a little Power package! Thanks to the Internet, Google Earth and the website of the huge orange "low-cost carrier". I got all my travel arrangements and bookings done within two hours. However, the price of the ticket from Basel to London-Gatwick reminds me rather more of a business class fare of British Airways or SWISS and not like a "Low Cost" fare. To be fair I have to say that I can’t expect a lower price on short notice. Early in the morning I had already arrived at the Euro Airport not to miss my flight to London-Gatwick. Endless cueing-up I gladly accept it, because I knew that I was able to get the second last seat on this morning flight to London. On time at 7:05 the A319 took off in the direction to England. After a little over an hour I reached Gatwick. On my way to passport control I spied the first, recently delivered Boeing B787-800 "Dreamliner" for Thomson Airways on one of the docks of Terminal 3. With my train-ticket to Honiton, Exeter in my hand I took the monorail to Terminal 1 where British Rail station was. A few minutes later the train arrived and my four-hour train journey to South West England could begin. Despite my fears of a boring long train journey, it turned out into a real experience; in the form of a well-off, English gentleman who sat opposite me in the compartment. After a short "small talk" it turned out that we both had the aviation as Passion. He told me about his experiences as a Lancaster pilot during the Second World War and how dangerous these inserts were then over Germany. With his 91 years he had probably experienced a lot of good and sad things in his live, but still bursting with joie de vivre; after all. In Honiton arrived he continued his journey to Exeter. Barely got out of the train greeted me at the station of Honinton the husband of my "slumber mother" to pick me up. After a short drive we arrived at their place and the rest of the day I spent with sightseeing in Honiton. In the evening I met Neil Harvey at the Indian-restaurant for a cozy dinner and we discussed the flight and travel details for the next day. Such a long day came to an end and I was looking forward for an exciting day next morning! After an ample "English Breakfast" it was time to drive towards Dunkeswell Airfield where our Eclipse-500T was ready for the flight this day. This former Air Base truly has a turbulent history. During the Second World War, it was home of the United States Air Force and the U.S. Navy with their PB4Y-1 Liberators served as a base for combating enemy submarines in the Atlantic. Today it is nothing more to see, except a memorial monument commemorating this time. With its two runways of 644 m and 968 m it is now used for pilot training, business aviation and the resident parachutist club. After David Hayman had obtained all the flight information from the Flight Center, we drove to the parking position of the Eclipse 500T. Once there the fuel truck arrived and begun to fuel the aircraft. In the meantime I had a free hand to photograph the Eclipse from imaginable positions. A good half hour later it was time. "Boarding for everyone". So David decided spontaneously that I should be responsible for opening and closing of the cabin door. Time for take-off!. After about 500 meters the Eclipse 500T gently lifted off from the runway and climbed into a left curve to the sky. The climb performance of this small business jet was remarkable and so we reached our cruising altitude of 8000 m after about twelve minutes. Equipped with headset I was able to follow all the radio traffic between Eurocontroll and the cockpit. Despite brisk air traffic David always had time to communicate the latest information, route changes and the technical highlights of Eclipse via intercom to me. I eagerly listened to the radio traffic and David and Neils comments. Impressive was of course the fact that the Eclipse was controlled by side-sticks and three large color displays dominated the Flight Deck and provided and indicated all relevant flight data’s on demand. Along the south coast of England, we continue our flight towards the Channel coast, passing France and Holland. At the height of Amsterdam, David led the descent to our first stop at the airport Groningen, Holland. The decent was accompanied by violent, side wind gusts. Buckle up was announced! After we had flown through the turbulent zones, there we were only a few miles away from the airport. Gear down ", one last right turn and the Eclipse were on the perfect glide path toward the runway of Groningen. Touch-down; and after a few hundred meters, the N843TE rolled out gently and turned into the taxiway, one that would lead us directly to the General Aviation Center. Arrived a small reception committee, led by Steven Middendorp, Managing Director of Cirrus Aircraft, Europe welcome us in Holland. After a short small-talk and a tour in the hangars, the gentlemen’s went to their business meeting. Time for me to make the hangar halls insecure with my camera; but only after I had received the permission. Logically, I also used the time to look around the terminal at Groningen Airport. Except Tansavia, Ryanair and Corendon Dutch Airlines is hardly traffic expected in Groningen. During my stay there was only one B737 of Ryanair at the apron. No problem, I got my much needed coffee in the restaurant at the airport without a long wait. Two hours later we met again at the aircraft on the apron. To assess his look on David’s face the business talks where successful. In the meantime, the aircraft was refueled again, which should be enough to fly us to Bern-Belp via Belgium. Since we took off in England, I had to have a strange feeling something forgotten or not noticed? Everything was perfect; Forgotten I had nothing and shortly after take-off in Groningen on the way to Wevelgem, Belgium to our next stopover, I leaned in my noble, leather-covered chair and tried to enjoy the flight. I looked around in the cabin; and suddenly it appears in my mind: This business jet has no Toilet! This cannot be true; regarding a U.S. $ 2.89 million expensive jet, I wondered. This fact I wanted to clarify with David after the next landing. Have seriously the designer forgot to provide this jet with a toilet?! Shortly after landing in Wevelgem "International Airport" David explained to me the situation. At this size of the jet and its range of good two hours a quiet little place is not necessary and also not prescribed. Reassured, I took this statement to the attention; and we were looking forward to the potential clients from Belgium who likes to buy an Eclipse. The customer and his pilot were waiting for us already at the terminal. A short welcoming broke the ice and our guest with his private pilot was already excited for the upcoming flight to Switzerland. Armed with a camping cool box filled with white wine, beer and soft drinks in one hand and a cardboard box filled with chocolate Éclair’s in the other hand, it went straight to the aircraft. We do not want waste any time! Door closed, was my task, engines running and we rolled to the runway.A bit heavier than before (drinks and éclair’s on board) we lifted off once more gently from the runway and vanished in the direction of France and Switzerland. Already given my headset to the customer I enjoy the flight over a almost cloudless sky over France. Often squinting to our client, I noticed how he prepared the éclair’s and the drinks in an unfamiliar ceremony for consumption. In the meantime, we passed Paris eastside and found ourselves at a cruising altitude of 12,000 m.
In slight descent we turned, after a onehour of flight, near Lake Geneva towards Bern. The Panorama of the French Alps, near Lausanne showed up on this sunny July day at its best. In the further descent we passed the Lake of Neuchatel, flew over the military air base Payerne along the River Aare and in the background we could see the three great lakes of the Central and Western Highlands. It was short over Bern "gear down" and the N843TE turned into the final approach to runway 32 at Bern-Belp. One last curve before landing showed us the breathtaking scenery of the Eiger, Mönch and Jungfrau from the perspective of a passenger. After a perfect landing the "Follow Me" vehicle was leading us to our parking position at the General Aviation Center in Bern-Belp. Back on solid ground, it was time to say goodbye. A warm hug, accompanied by a solid "hand-shake" we went our separate ways. That we will maintain contact with each other, was clear for all! A long, successful and memorable day/flight came to an end. An unforgettable experience, no question, although I have worked as a maître de cabin in the early 1980s on BIZ Jets in Kuwait, is one such in-flight experience in these days and age are something very special. Technically the benefits of the Eclipse 500T are impressive and I am confident that the successor model Eclipse 550 will prevail on the aviation market in its class. With operation costs of less than U.S. $ 1000 per flight hour, this is probably a strong argument for future customers.